Tired of searching through dozens of sites to find a specific campus service? Wish it was easier to get things done on your mobile phone? 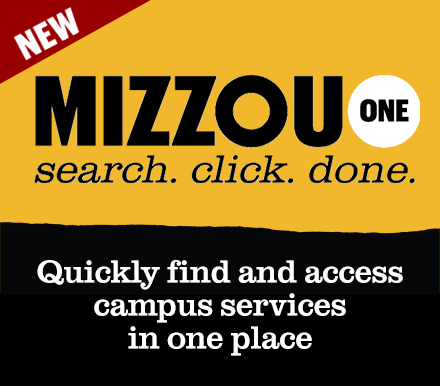 MizzouOne, a new tool for MU students, makes it easy to find what you need—anywhere, any time, on any device— and get things done! MizzouOne is a student focused portal that makes it simple to accomplish important tasks like finding classes, checking grades, and paying bills. MizzouOne was created to bring a modern app store experience to finding what you need at MU. With MizzouOne, you search for what you want to do, and click to launch it. MizzouOne supports access from smartphones, tablets, laptops, and desktops. The interface is designed to be consistent and familiar, and provides simple but powerful search capabilities that help you quickly find and access the IU services you need to accomplish important tasks, such as finding classes, checking grades, and paying bills. For questions and feedback regarding MizzouOne please email mizzouone@missouri.edu.